Montgomery County police say that the suspect in the shooting that killed three people in Brookeville, Maryland, has died of a self-inflicted gunshot wound. 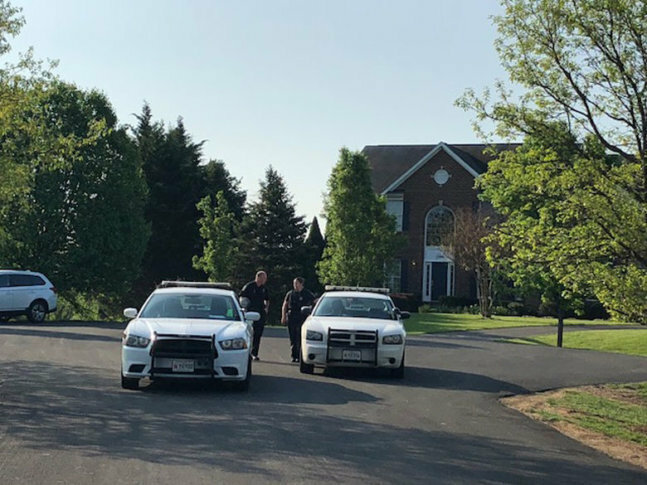 WASHINGTON — The suspect in a shooting that killed three people in Brookeville, Maryland, died of a self-inflicted gunshot wound after an hourslong standoff on Monday, according to Montgomery County police. The suspect was identified as 41-year-old Christopher Wilson Snyder. Police said he lived across the street from where the shooting happened. Police learned that a total of six people were inside the house at the time of the shooting. Three other adults — one of them the suspect’s wife — were able to escape the home unharmed. “We do know from talking to the suspect’s wife, she reports that she had been held by her husband over the weekend and took an opportunity to run into the house,” said police chief Tom Manger at a news conference on Monday night. The identities of the victims has not been released, but Manger said police believe one of the victims lived in the home, another one was a guest of the homeowner from out of town and the third appears to be someone who was working at the home. Police said situation began at 3:44 p.m. when they received multiple 911 calls about a possible domestic situation involving a man with a gun in the 22000 block of Brown Farm Way. Manger said some of the call takers heard what sounded like gunshots in the background of some of the calls. When officers arrived on the scene, they found three people dead inside the home. All three victims had been shot. Police said Snyder, who was still armed, fled to his residence across the street after the shooting and refused to come out for hours. Tactical officers, negotiators and the Bureau of Alcohol, Tobacco, Firearms and Explosives were among the personnel at the scene. Officials set up a perimeter around Snyder’s home. Negotiators spoke to the suspect via phone, in attempts to get him to surrender. After several hours of negotiations, at around 11 p.m., a tactical team breached the front door of Snyder’s home. “When they breached the front door, the suspect was on the phone with negotiators. He asked negotiator ‘Did they just break in the front door?’ and then hung up the phone,” Manger said. Officers then heard a single gunshot. Snyder was found dead in his home from an apparent self-inflicted gunshot wound. Police were still searching the home for explosives because “there was some discussion about explosives” during the standoff, Manger said. Manger said police have had “a number of contacts” with Wilson over the years. The area of the incident, located near Rachel Carson Conservation Park, is a rural cul-de-sac with larger homes. (See map below.) People living in the area were asked to shelter in place, and some residents returning from work weren’t allowed back into their homes during the duration of the incident. As of 8:30 a.m. Tuesday, police were still on the scene investigating. WTOP’s Jack Pointer and Michelle Basch contributed to this report.